What is kimchi? according to wikipedia Kimchi is a traditional Korean food, a type of pickled vegetables fermented spicy flavored. Once salted and washed, mixed vegetables with shrimp seasoning made from krill, fish sauce, garlic, ginger and red chilli powder. The most common vegetables are made kimchi cabbage and radish. In ancient times, kimchi pronounced chim-chae (Hangul: 침채; Hanja: 沉 菜) which means "vegetables are soaked." In Korea, kimchi is always served at mealtimes as one of the most common types of banchan. Kimchi is also used as a spice in cooking as kimchi stew (kimchi jjigae), kimchi fried rice (kimchi bokkeumbap), and various other dishes. Nutrient content of kimchi is no doubt, because kimchi is made of fresh vegetables. But not everyone likes kimchi, for example my husband: P maybe because it was sour and spicy. When I first tasted at a restaurant, I also was not too like kimchi may be because the smell is too strong, there is also kimchi in a food court but it was not smells fresh (like.. unhygienic). 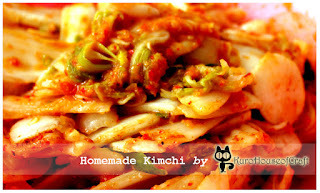 Like or not, likely depends on who is the Cook, so I was curious how that made my own taste kimchi, fresh and hygienic. After searching various articles, most of the recipes that written in bahasa seems not really sure (not in terms of writing but the weave). Therefore, I also searched and searched to find the right recipe and finally I got it. 17. 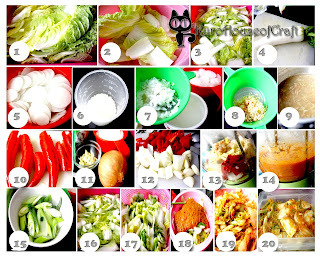 Rinse the cabbage and rinse several times, taste it whether its too salty or not, if it is not too salty, drain. do the same thing for radishes and scallions. 20. Place the seasoned vegetables into the jar(plastic / glass jars) and do not too full because the fermentation will produce water, reserving 20% ​​of the jar. Cover tightly, let it at room temperature about 24 hours. Kimchi ready to eat, and after that please store it in the refrigerator (2 weeks) or could be in the freezer (up to 1 month).